UPDATE: This post has been changed since it was first published. 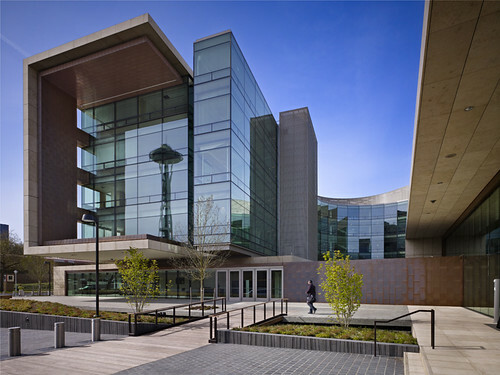 Details of how to register for tours of the new Gates Foundation campus have been updated. One of Eastlake’s most famous residents, the Bill and Melinda Gates Foundation, is celebrating its move to a new campus near Seattle Center this week. The foundation, which focuses on world health issues, will be holding a public open house at its new headquarters on Saturday, June 4. 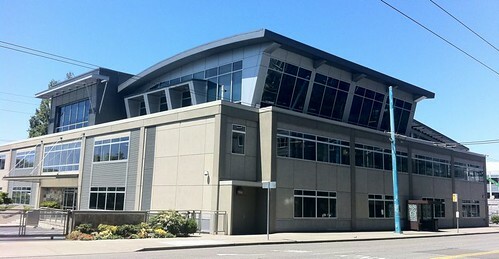 The largest private foundation in the world, the Gates Foundation kept a low profile in Eastlake. The foundation’s staff moved into a former SeaFirst Bank check processing facility at 1551 Eastlake in 2000. There was never a sign on the building to announce the famous tenant within. Melissa Milburn, a spokesperson for the foundation, says the organization’s low-key nature was the result of wanting to focus more on “the work and on the people doing the work on the ground – our grantees and partners.” As the importance of advocacy grew, she says, the foundation became more public, doing interviews and raising its profile. But it never made a big deal out of its presence on Eastlake. The foundation later added a third floor to the 1551 Eastlake building. Near the 14 Carrot Cafe in the 2300 block of Eastlake Avenue E.
In the former AT&T wireless building at 617 Eastlake E.
In the former Onvia building at 1260 Mercer St. In the Hart Crowser building at 1700 Westlake Ave. E.
On Friday, it appeared that Gates Foundation staff was mostly moved out of 1551 Eastlake. A crane had hoisted a dumpster to the roof and the sound of workers dumping left-behind items into it could be heard. The move of the Gates Foundation will leave a significant amount of office space open and available in Eastlake. The building at 1551 Eastlake is about 100,000 square feet. It was announced last fall that the Puget Sound Blood Center would be leasing approximately 45,000 square feet of that space. The rest is presumably still available. There’s no word on possible tenants for the other buildings where the foundation leased space. Gates Foundation staff who would know how much space was occupied by the foundation between the five buildings were busy setting up for Saturday’s open house and weren’t available Friday. Registration has closed for Saturday’s open house at the new foundation headquarters at Seattle Center. Registration will reopen at 10 a.m. Saturday at the new campus for one-hour time slots to visit the new campus between noon and 4 p.m. The Seattle Times previewed the new Gates Foundation buildings in this story, which also includes several photos. The Times reported on a reception for 1,000 community leaders at the new building on Thursday evening. SeattlePI.com has a slideshow from the Thursday evening. John Cook at GeekWire.com reports that Bill Gates wrote the checks for the new campus, but Melinda Gates was the vision behind it (it cost $500 million). David Bley writes on the foundation’s blog about the new campus (includes a slideshow). This entry was posted in Uncategorized on June 3, 2011 by cdmilton.